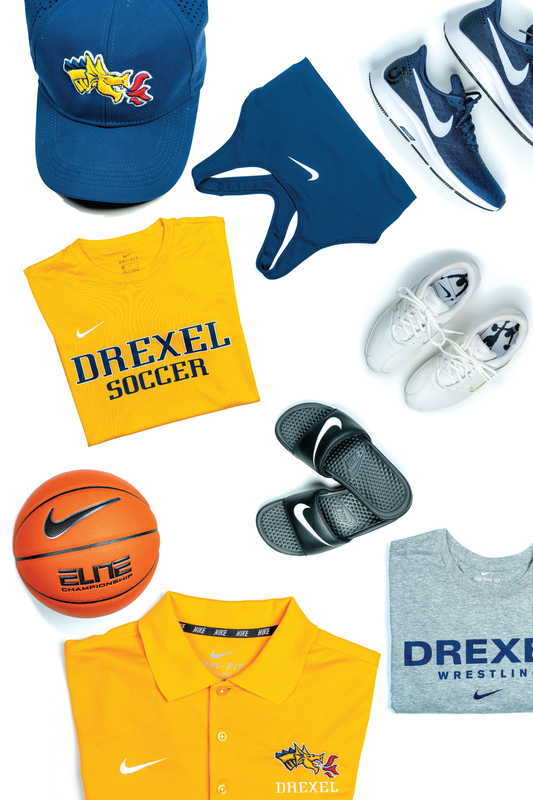 A new agreement between Drexel and Nike means that student-athletes will wear the best schwag of them all: the swoosh. Over the summer, the Drexel Athletics Department signed a five-year deal that will ensure (almost) all Dragon student-athletes will wear Nike when they compete, train and travel. “If Nike offers it, our teams are using it or wearing it,” says Nick Gannon, deputy athletic director. The partnership, which began July 1, includes numerous incentives in the form of discounts and rewards for on-field achievements, along with additional marketing and promotional opportunities. While several of the University’s teams wore Nike in the past (both basketball teams have been outfitted by Nike for years), the deal, which includes supplier BSN SPORTS, formalizes the relationship between the school and the iconic company. When the Drexel Athletics Department began examining signing an all-sports apparel deal, Gannon says it considered Nike, Adidas and Under Armour. “Because of the brand power of Nike, as well as our history with Nike, we went in that direction,” he says. Men’s lacrosse, which will continue to wear New Balance and Warrior, is exempt from the deal. In addition, the swimming and crew teams also won’t wear Nike while competing, but team members will sport the swoosh when they’re in the weight room or heading to a competition. Club sports will be encouraged — but not required — to wear Nike. More than 40 years after former University of Oregon runner Phil Knight and his college coach, Bill Bowerman, founded Nike, its name has become nearly synonymous with sports. The Beaverton, Oregon-based company has more than 74,000 employees and in 2015 reported revenue of more than $30 billion. It counts some of the world’s most popular athletes, including Michael Jordan, LeBron James and Serena Williams, on its roster of endorsers. Brendan Armstrong, Drexel’s head equipment manager, thinks that most athletes — regardless of their ability — like wearing the brand. He has worked at other, non-Nike schools, and he believes Nike to be the best. That visual identity will be seen around the globe on the torsos, legs and feet of Drexel student-athletes. The men’s basketball team traveled to Australia in August. Previously, it visited China and Turkey.